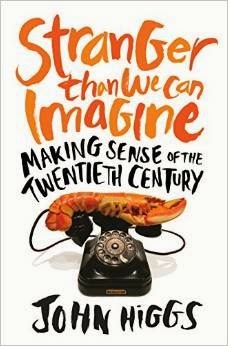 John Higgs recently posted a photo on Twitter of part of the index of his much-anticipated new book, Stranger Than We Can Imagine: Making Sense of the Twentieth Century. 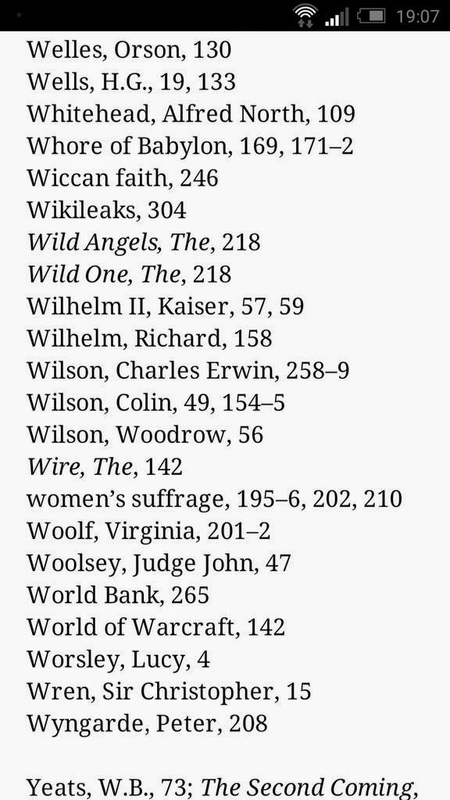 John remarked, "Checking the index of my next book. Out of context, it makes the book look totally bugnuts." 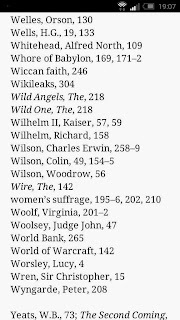 As you can see, although the index lists three people named Wilson, there's no mention in the index of an "Wilson, Robert Anton," and I couldn't resist remarking on that. John responded, "It's a bigger surprise to me, I can tell you. He dropped out during the last draft." John explained, "Book paints Twentieth Century in such a RAW way — Joyce, Korzybski, Crowley, multiple model agnosticism etc — the RAW bit was repeating itself." I remarked, "To be honest, RAW was not influential in the same way as the other folks you cite." John responded, "Give him time and he should be." And Ian "Cat" Vincent remarked, "Not directly, but often people he influenced were (Alan Moore, Grant Morrison spring to mind)."